A lifesaving piece of technology has been installed on the wall outside The Bell Inn on Adderbury’s High Street. The Automatic Electronic Defibrillator can make the difference in whether a person suffering a heart attack lives or dies by administering essential first aid in the vital minutes following cardiac arrest. The Defibrillator was purchased thanks to generous donations from The Bell Inn’s customers, the Hook Norton Brewery and several local clubs and organisations. With the equipment now installed training has been organised, which will be undertaken by the local South Central Ambulance Service First Responders who have kindly offered to run courses to ensure residents would feel comfortable if the need arose to operate the defibrillator. Start CPR – the emergency procedure that combines chest compressions with artificial ventilation to keep the person alive. Ask someone to bring a defibrillator. 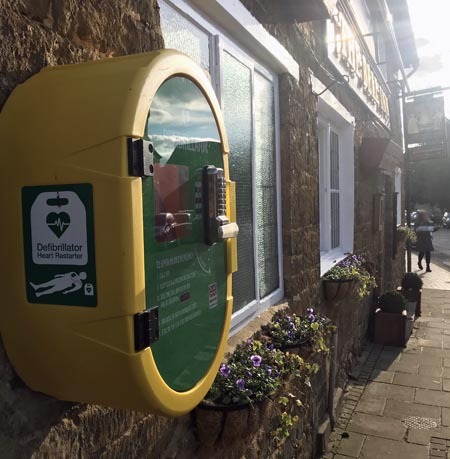 The defibrillator can be found on the front wall of The Bell Inn, under the street light in an illuminated cabinet next to Adderbury Stores. It is available 24 hours a day and anybody requiring access to the unit should phone 999 and they will be given the code to unlock the cabinet and instructions on caring for the patient. The defibrillator is an intelligent unit and, once set up, monitors the patient itself deciding if a shock needs to be administered. Two courses will be run at The Bell Inn on Thursday 7th March, the first at 2.30pm and then later that day at 6.30pm. The course will last two hours and is free to attend. Tea and coffee will be provided. If you wish to attend a course please phone The Bell on 01295 810338 or email Chris Shallis (chris.shallis@hotmail.co.uk) to reserve your place.